Place sugar, leaves from mint and lime peel into a dry TM bowl. Mill Speed 10, 15 seconds. Set aside. 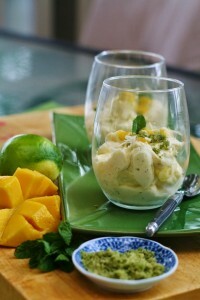 Add mango flesh to the bowl and puree Speed 5, 10 seconds. Set aside.